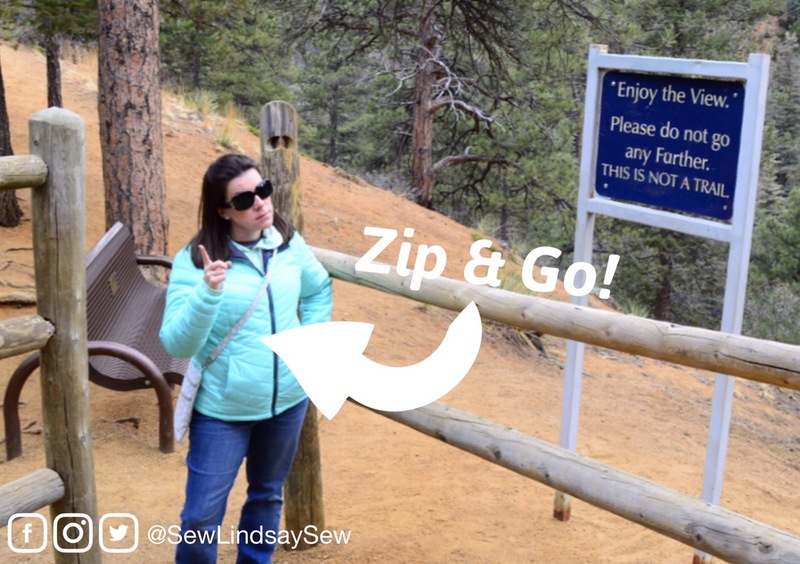 alterations | Sew Lindsay, Sew! I recently had the opportunity to travel to Colorado Springs with my friends Joe and Chris – just for fun. A vacation for the sake of vacation! And let me tell you… we had the time of our lives. Our heads were truly in the clouds! We walked in the footsteps of Olympic athletes at the Olympic Training Center! And – the highlight of the trip – WE FED WOLVES (Disclaimer: We did this at the Colorado Wolf and Wildlife Center. Do not try this at home). Sooooo… where does sewing fit into this story, you ask? Well, there are two sewing stories. It’s rare that I take the time to sew for myself, but the deeper I get into this sewing journey, the more I realize how useful this skill really is. And this time, it played a part in my vacation prep! I really wanted to have a simple travel purse/bag for all of our adventures. I wanted it to be small so that I would only need to bring the bare minimum with me on each outing – cash, ID, credit card, phone, lip balm, car keys. I really, really, really love the Zip and Go bag from Dog Under My Desk that I made a few years ago using a pair of Mickey Mouse boxer shorts. It’s my go-to bag every time I visit a Disney Park! But, while the Mickey Mouse fabric is perfect for a Disney Park, I thought it might be a little out of place out there in the real world. Plus, I thought the red/black combo might look a little “loud” in our photos, so I was looking for something a little more subtle. So, a week before the trip, I whipped up a gray, polka dot Zip and Go using fabric and hardware I already had on hand. I only had to purchase the zippers! The bag is lined with a solid teal fabric… which is not pictured, but I know it’s there! 😉 I had to add a little bit of color to the bag, even if it’s hidden on the inside! The bag was PERFECT for the trip! I am so glad I took the time to make it happen. I really adore the simple utility of the Zip & Go. Here’s a pic of it in action! We were hiking Helen Hunt Falls and I was giving a stern pose in front of a stern sign. You can see that I’m wearing the bag in a cross-body fashion for the hike. While I was packing for the trip, I revisited the rules on the Colorado Wolf and Wildlife web site. We had signed up for the special “Alpha Tour” because we really wanted to have one-on-one interaction with the wolves, but for obvious reasons, there are some pretty unique safety rules in place for those participating in the experience. For example, while interacting with the wolves, you cannot wear fur (even faux fur) or sheepskin. You also cannot have fringe, tassels, etc. on your clothes. These are the exact wolves we met! Raksha and Isha – they are Arctic wolves and only 10 months old. While revisiting the rules, I realized that even skinny jeans were banned. Well, ever since I identified the need for skinny jeans in my life a few years ago, I have pretty much only worn skinny jeans. I’d outgrown or worn out all of my non-skinny options. So, just a day prior to our departure, I headed over to Old Navy to grab some boot cut jeans for my wolf adventure. And of course… they needed to be hemmed. Once again, I experienced the magic of hemming jeans and maintaining the original hem. It’s one of my favorite sewing techniques. So useful and impressive! And honestly, I’m glad that I had two pairs of jeans on the trip. I ended up wearing the new jeans quite a bit, and I realized that the skinny jeans would not have been the best option for hiking, etc. So there you have it. Another vacation, a slew of life experiences, a million photos – and two more sewing projects for the books! Living in a warm climate, I planned to wear a dress for my special birthday dinner outing last week. But the evening of my birthday was cold and rainy – boo! 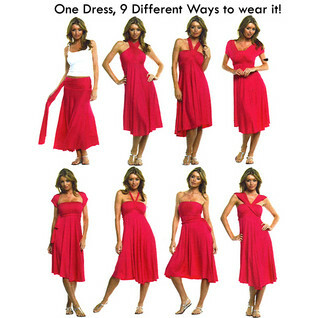 I decided to wear a dress I bought a few years ago in St. Augustine – a convertible dress by Elan-USA that can be twisted and tied in lots of different ways. The plan was to fashion a dress with sleeves to keep warm. But as soon as I put the dress on, I was reminded why I rarely wear it: it’s too long. Being five feet small, the dress is almost ankle length on me, which makes it feel a little too formal. But the dress itself is made out of a jersey-knit material and is supposed to be a semi-casual dress. I would never actually wear it for a formal occasion. I picked up the hem of the dress to examine it, wondering if I could attempt to hem it myself, and was shocked to see that the dress had no hem at all! It looked like freshly cut, jersey knit fabric. How come I had never noticed that before? So I cut. And cut. And cut. Then, the moment of truth: Dress + Lindsay + Mirror. It… was… PERFECT! I think I’ll be wearing it more often now that it’s the proper length. And now I have a long, thick remnant of fabric leftover that I can use as an extra sash for the dress. I wouldn’t have had the confidence to make the cut without my newfound interest in sewing. I never would have looked at the hem of the dress in the first place! Have you ever made a last minute alteration? 1. The most reasonable excuse to start sewing is that you can fix or alter your own clothes. I’m 5’0″. Try finding a new pair of pants that doesn’t drag on the ground. Enter sewing machine. Amen. 2. My friend Krissy often stated in her phenomenal wedding blog something along the lines of… “If you can’t find exactly what you’re looking for, or for the price that you want, MAKE IT!” And that wonderful sentiment not only applies to table centerpieces and wedding invitations, but sewing projects as well. Don’t be a slave to what’s on the shelves. Make it your way! 3. Custom gifts for family and friends. What do you get for the person who has everything? A personalized, handmade item a la you! 4. Finally, an excuse to venture over to the other half of the craft store. 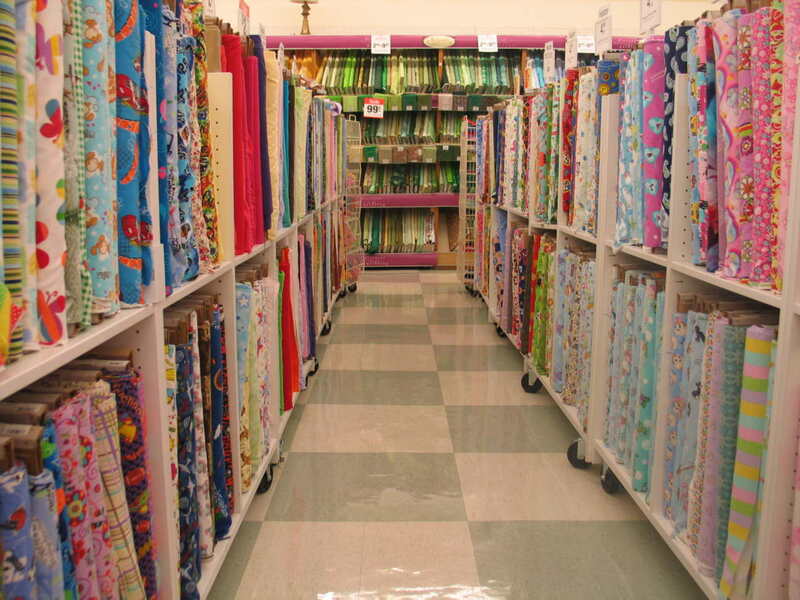 Now you can browse through all of those fun fabrics… with purpose! 5. Because all the cool people are doing it. Haven’t you ever watched Project Runway?